A professional and thorough service restoring 2 showers at considerably less cost than replacement. Highly recommended. Great, professional, friendly, reasonably priced service. Highly recommended. Nothing unexpected: Mick explained at every stage what the job would entail and completed the work promptly: a very neat and tidy job. Mick at the Tile Doctor was really helpful and went above and beyond to help us sort out some damage to a kitchen floor in a timely manner. He was thorough and kept us updated at all times to what was needed and no problem was too big. I would definitely recommend. 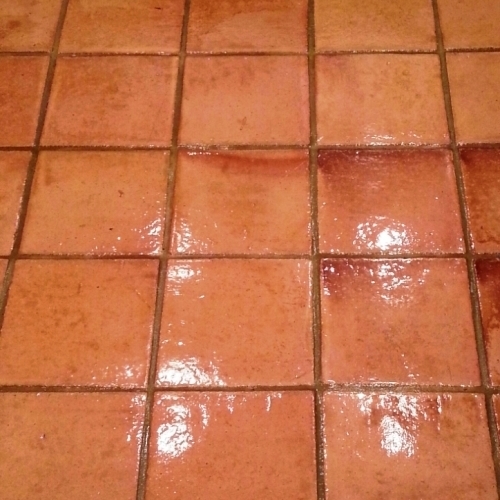 Mick did a brilliant job at restoring our porcelain kitchen floor tiles to make them look like new. He gave brilliant advice and keep us updated along the way. Our tiles now look as good as the day they were laid. We would most deffinelty recommend Mick to family and friends. I didn't realise how dirty my kitchen tiles had become however once Mick had finished with them, they are better than new which has transformed our kitchen! I'm a bit of a perfectionist and to say I am happy with them is an understatement! Mick is a true professional and expert in his field and I thoroughly recommend him without any hesitation. Thanks again Mick, a fantastic job. First class. From start to finish, job rectified and good advice on how to manage the situation going forward. Will recommend without reservation. Mick rejuvinated our limestone tile floor to a much better condition than when it was first laid - we were very pleasantly surprised. He also has a huge amount of experience and will provide best advice, even if this means he will end up with less work. We're lucky to have him in our area. We are delighted with the appearance of the restored quarry tile floor, which was finished today. As it was, the previous owner had put multiple layers of varnish over it and, we think, over dirt that had entered the porous surface of the tiles. All this is gone and the original colour restored. The floor has been coated with a polymer film and we are hoping that this will last very many years. Mick has paid great attention to detail and has really gone the extra mile with work on the floor that we would reasonably have expected not to be included. We're very happy to recommend him. Mick contacted us very quickly after our initial contact with the Tile Doctor. He was able to visit us in South Essex the next day to see our minute porch measuring 5 feet by 3 feet. He worked for over 2 hours to restore the tiles to as new condition. Brilliant work considering they were in a poor condition. He was also very helpful with advice for future maintenance. An excellent service from last year's Tile Doctor of the Year 2016. A thoroughly deserved title! Friendly but professional service restored my natural stone floor to a fantastic finish beyond my expectations. I highly recommend this service.